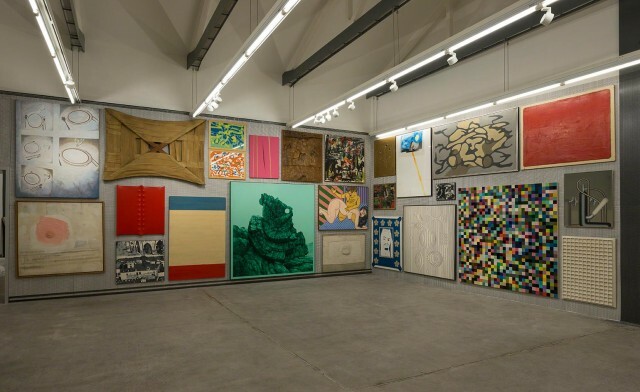 It took Miuccia Prada and Patrizio Bertelli almost 10 years to complete their dream project: a public art venue to exhibit all their collected works of art. 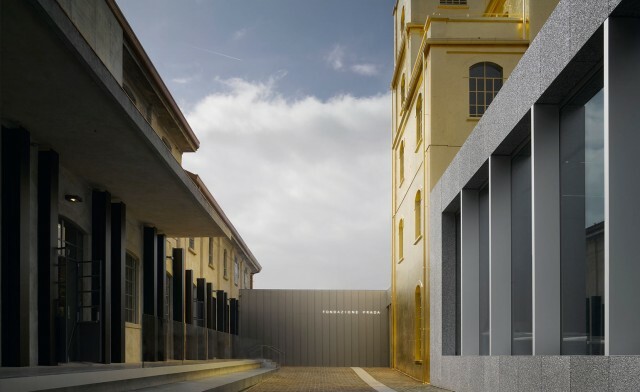 On Saturday the 9th of May Fondazione Prada finally opened its door to the public. 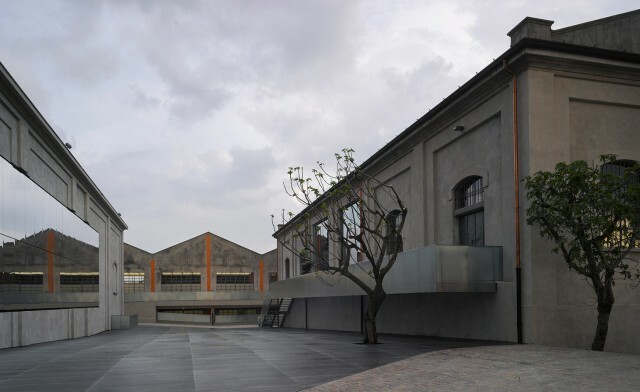 This art village in the suburbs of Milan is located in an old gin distillery from 1910 with architectural reconditions and extensions made by the Dutch architect Rem Koolhaas of OMA/AMO. 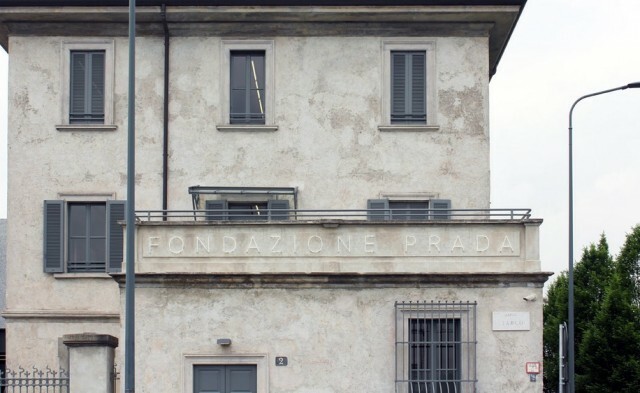 The permanent space of Fondazione Prada is located on Largo Isarco, a street in the industrial area of Vigentino in the southern periphery of Milan. A district with (apparently) a pretty bad reputation and thus not the place where you would expect the rise of a truly Prada art center. With this art space, Miuccia wants to initiate a new way of exhibiting artworks. She believes that the way exhibitions are displayed lags behind the huge expansion within the art system itself. 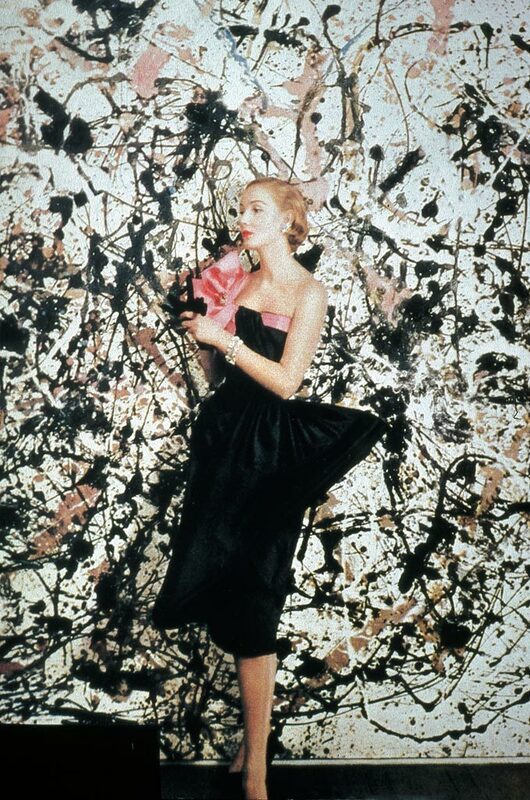 As an example, she mentions the white cube, the industrial space and the contemporary art museum, which doesn’t differ much from a department store and art fairs anymore. 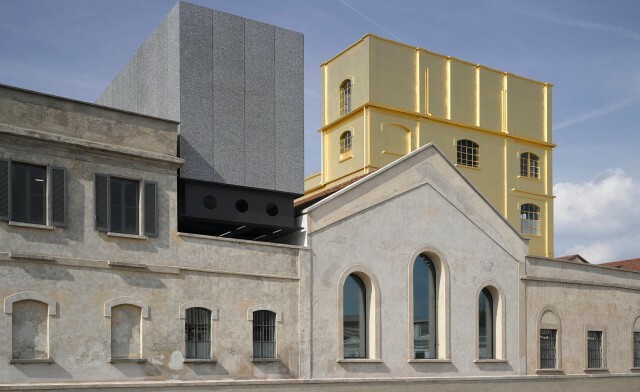 New, old, horizontal, vertical, wide, narrow, white, black, open, enclosed, all these contrasts establish the range of oppositions that define the new Fondazione. 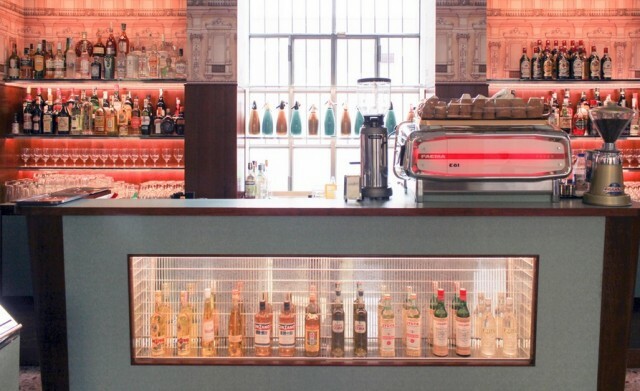 The cafe inside the Fondazione Prada is named Bar Luce and designed by Grand Budapest Hotel film director Wes Anderson. The cafe’s wallpaper is modeled after the iconic Milan Galleria Vittorio Emanuele II, a shopping arcade where Miuccia’s father Mario Prada opened his first shop in 1913. The bar’s interior design is inspired by the typical Milanese cafes from the 50’s and 60’s and the Italian neorealistic films of Vittorio De Sica and Luchino Visconti. 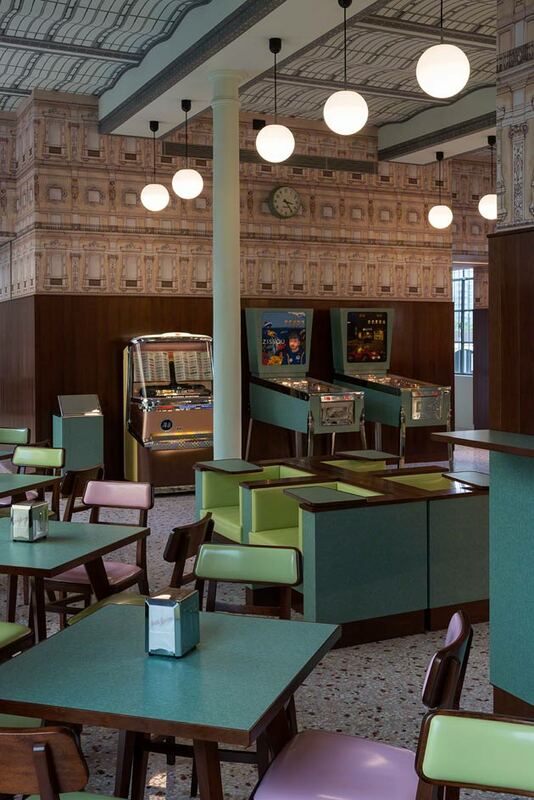 Expect a lot of veneered wooden paneling, Formica furniture in green and pink pastel colors, a terrazzo floor, jukebox and even some vintage pinball machines! 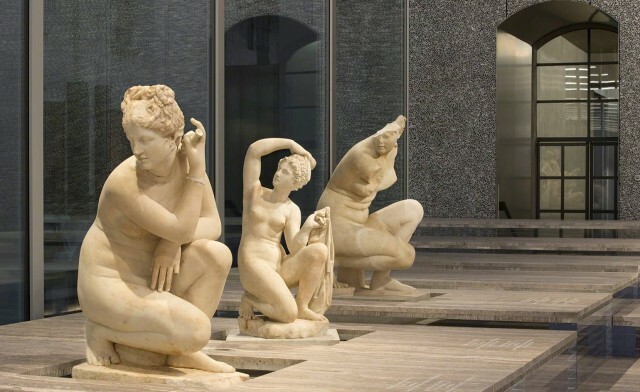 Next to the exhibitions with works from Elmgreen & Dragset, Carsten Höller, Lucio Fontana and Damien Hirst (to name a few artists from the Collezione Prada), Serial Classic is the main exhibition of the Fondazione Prada, with scenography designed by OMA. This exhibition explores the use and reuse in classical art and the idea of originality and imitation in ancient Roman culture. Serial classic is part of a twin exhibition together with Portable classic which is on display at the Fondazione’s location Ca’ Corner della Regina in Venice.